One of the largest pallet organizations in the world is the quality-oriented NWPCA (National Wooden Pallet and Container Association). A growing number of NWPCA Pallet Professionals™ have expanded their product lines and services to include plastic, composites, etc., in order to better serve their customers' diverse shipping needs. Information and pallet graphics which follow are courtesy of NWPCA. WOOD - Wood pallets are the only pallet made from a reusable, repairable, recyclable, cost effective, and renewable resource. PLASTIC - Uniform in size and weight, plastic pallets offer high reusability. Many plastic pallets are constructed of recycled materials. A growing number are repairable and recyclable. METAL - Generally made from light weight steel, aluminum or stainless steel, with all welded construction, galvanized or painted finish, and having extended life expectancy. COMPOSITES - Typically created from uncontaminated, selected wood waste, these pallets are themselves recyclable. PAPER/CORRUGATED - Lightweight, manufactured of recyclable corrugated sheets. CPC PALLET - Wood Pallets manufactured and repaired to Canadian Pallet Council Pallet Manufacturing & Repair Specifications. 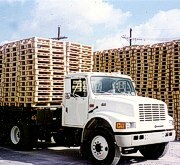 FOUR-WAY BLOCK PALLET - A pallet with openings at both pallet ends and along pallet sides sufficient to admit hand-pallet jacks; full four-way entry pallet. SPEQ™ PALLET - Uniform Standard for Wood Pallets - SPEQ™ Pallets must meet an identical level of quality, regardless of who builds them or for what application they are built. Licensed SPEQ™ suppliers must pass an ongoing series of stringent surprise quality inspections by an independent quality auditor. STRINGER PALLET- A Stringer is a continuous, longitudinal, solid or notched beam-component of the pallet used to support and space the deck components, often identified by location as the outside, interior, or center stringer; bearer; runner.